Courtesy of Jennie – My Travels. “Pretty much anyone can go down and measure a turtle and grab eggs,” says Nahill. “It’s not like darting a tiger…it’s safe.” And he should–that’s how he started out in turtle conservation after college. In many ways sea turtles–which are all either endangered or threatened–are the ideal eco-tourism target. Even the non-skilled can help–whether that’s doing research, patrolling beaches or just showing up on tours. Just the tourists presence can keep poachers away, says Nahill; even better, they supply the money for the guides and guards. Nahill hopes to maximize the impact of See Turtle volunteers by picking only programs that that help animals “facing threats that tourism can directly reduce.” That means the programs end up helping the community by offering locals a job or financial incentive to protect the animals instead of making money off them in other ways. Years ago, fishermen who also poached turtles in Baja, California, told the group’s other co-founder, Dr. Wallace Nichols, that they’d be willing to stop if they had another way to make a living. Many were already guides to the area’s seasonal friendly gray whales, so Nichols founded Groupo Tortuguero, which got communities working with turtles. 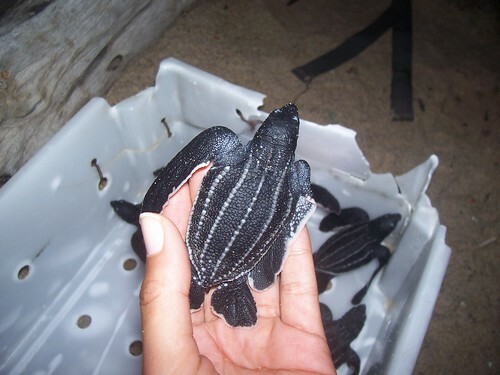 In one project, for example, locals help catch turtles by net each month for researchers. More commonly, they can guard beaches or guide tours. And some get paid by offering researchers, volunteers or tourists a room in their home and meals. These days, their biggest threat is getting caught in fishing gear, Nahill says, but that’s still a significant take. And every day the mean are working on turtles, they’re not fishing. More importantly, the tour groups have already helped change attitudes: the eggs are a lot less enticing to eat if you, your uncle or your friend depends on their hatching to survive. See if See Turtles knows of any turtle work that matches what you have to offer. Five Questions Lesley Stahl Didn't Ask the "Frozen Zoo"